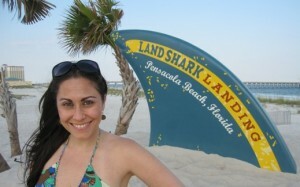 If you ever find yourself in Pensacola, Florida, you will be pleasantly surprised. Not only by their white, sandy beaches and their southern hospitality, but also by the variety for us green eaters. For a light meal, I stopped at the End of the Line Cafe. It was a vegan coffee house and eatery that absolutely delighted me. They had some delicious sandwiches, salads and desserts. I had a phenomenal chipotle ranch tofu and veggie wrap as well as a great chocolate mousse pie. It was very indie, arty coffee house and you will love all of the local artists' contributions to the look of the place. They make everything in-house, like their cashew cheese, sauces and baked goods, and it's all fresh and delicious. It's a nonprofit co-op, so you're eating smart and spending smart! Don't forget to pop in to one of their Monday movie nights! You can check them out at The End of the Line Cafe. For a special occasion, we visited Jackson's in downtown. Right in the historic Jackson Square and very near the hip Seville Quarter (Pensacola's mini version of the New Orleans French Quarter, just a few hours west), Jackson's is a beautiful fine-dining establishment that went way out of their way to create an immaculate, vegan gourmet meal for me. I was blown away by the 5-course-meal that just got better and better with every dish. And might I mention the exceptional wine pairing with every course! With advance notice, Jackson's will accommodate any diet and they will hit it out of the park! Their information can be found at Jackson's Restaurant. If you're in the mood for a meal with a little south of the border flair, try Cactus Flower Cafe. With 3 locations across Escambia County, you can load up on fresh guacamole and salsa as well as their veggie tacos and burritos. Mmmmmexican goodness! Lastly, but definitely not leastly, catch a cool local band, a bottle of beer and a vegan snack at Sluggo's. In the heart of downtown, Sluggo's is the watering hole of choice for veggie-conscious artists and musicians. Definitely worth checking out! Try any of their yummy appetizers or one if their killer sandwiches like the vegan Philly cheese steak! Serving late night on weekends too! Take a nice Northwestern Florida vacation this summer and leave your worries about your taste buds and your tummy at home! For more information, visit www.healthyvoyager.com.